I made my own drawer pulls out of solid oak and I am glad I did they match the wood trim around the torsion box, no harm making the unit look as nice as you can. I made a little rosin paper holder for the end of the unit… keeps the glue and stuff off the hardboard top. I used solid white oak for a trim around the torsion box and also used some walnut dowels to hide the connection points. I needed this torsion box mobile so I used 8 casters , the table is extremely heavy and moving the unit is not easy but it is possible. I have just finished a new project for the workshop, I am replacing my current outfeed/assembly table with another that has a few features that my current one doesn’t have I will go into that in a little while. Since I am now working full time this project is likely to take a while to complete and will probably only get some quality shop time at home during the weekends and possibly a few nights as well. To keep the sawdust out of the drawers, wasnt sure if doors were a good idea because its just another layer to get through before you can access your carts contents, but I am glad I did. Without proper dust collection in my shop dust gets everywhere so I usually cover projects like this with doors or drawers. Pushe sticks and low profile accesories. 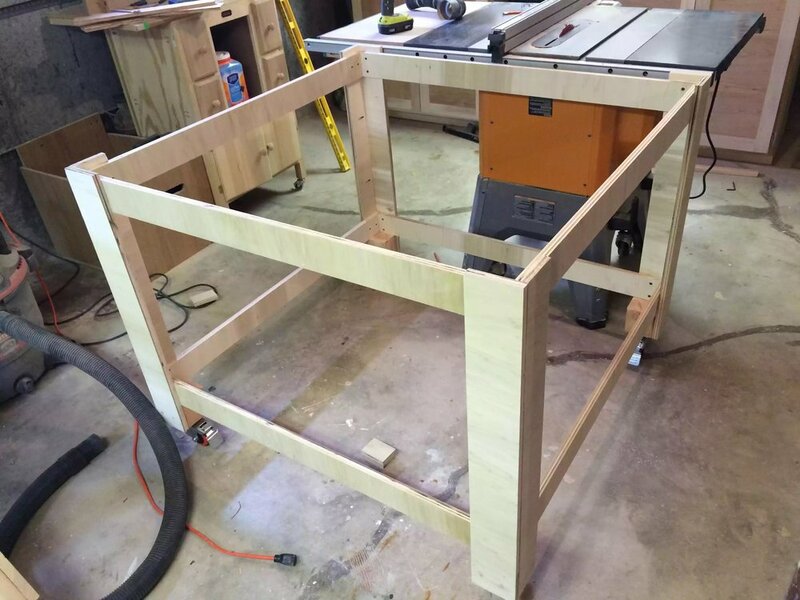 In case you haven’t noticed I have been working on my workshop to-do list for a while and next on my list was a Table saw Accessories cart, something that I can place directly under the right side of my table saw so as that I didn’t have to keep walking out of my way every time I needed to use an accessory for the saw, i.e. Dado stack, push stick or a million other tools I use with this machine. So I started looking online and I found this excellent plan that they wanted $9.95 for on Woodstore.net, I wasn’t paying that since I had to change the dimensions of the cart. But if your interested in purchasing the plans I included a link above. My error was that instead of actually measuring the right side of the table saw I used my owners manual and got the right side dimensions from there, not taking into consideration the Bevel handle on my table saw sticks out 7”, oh well lesson learned. 3. 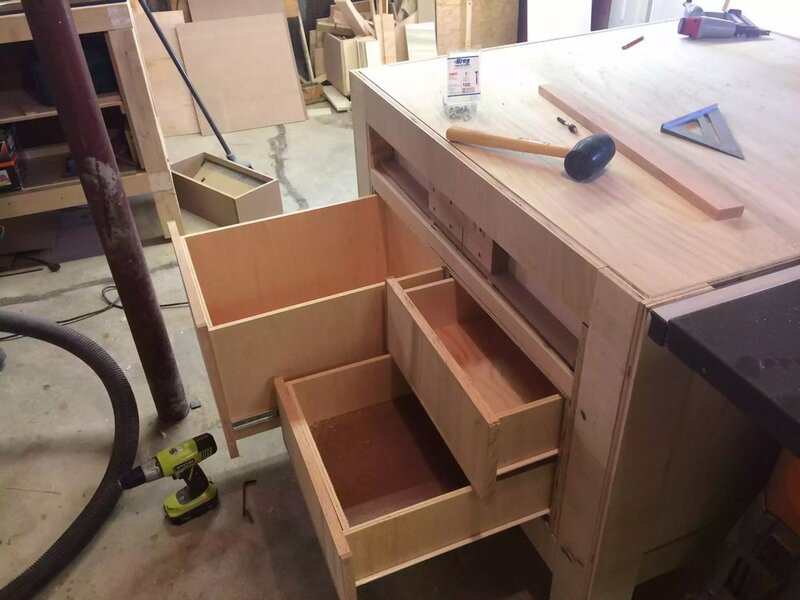 The drawers aren’t anything fancy and each drawer front has a different dimension 2”, 3”, 4”and 5” oak fronts, the drawer assemblies again are with pocket holes. 4. The doors were originally meant to be just plywood panels with iron on edging to pretty up the plywood edges but I wanted it to have a more appealing look, after all it did cost me a pretty penny. So I decided to put 3/4” oak inlays into the panel, staying 2” from outside edge, and it looks pretty good, I have never done any inlay work before and its not perfect but again another learning experience. 5. 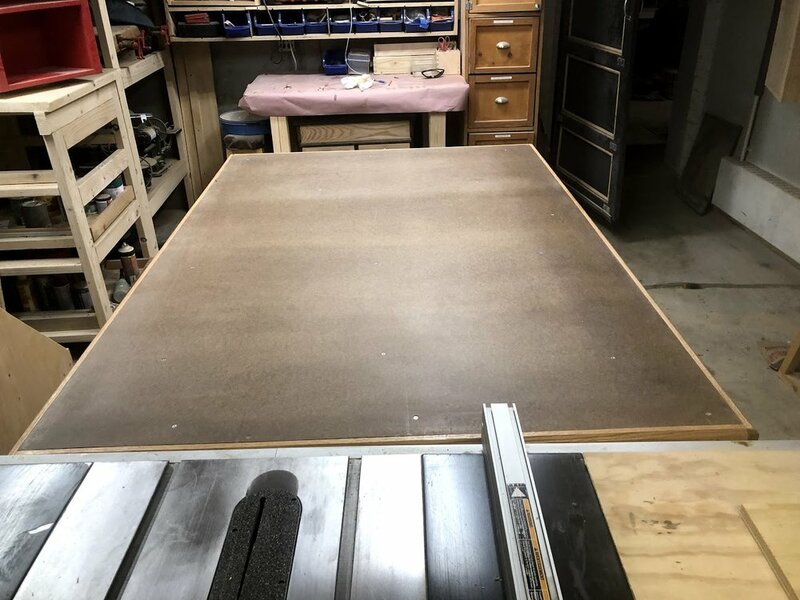 Casters: I purchased 2” casters because I didn’t think the unit would be that heavy but I will need to attach bigger casters down the road as it ways a ton with all the drawers and tools inside. 6. Door pulls: I decided to make my own. It couldn’t be easier. I used some 1×2 oak, ripped a 10 degree bevel on each side, round the edges with a 1/8” router bit on the router table, sanded it and attached it to the door panels with (2) 1 1/4” screws. 7. Last but not least I put 3 coats of Polyacrylic and sanded with 220 grit between each coat and it came out great, I am glad this came out ok because I was getting to the point to spending all this money building projects only for the finish to come out subpar..
Last but not least you would like to purchase the plans from Wood.net I have put it in a link below, I didn't because I needed to tweak th plans to my tablesaw. 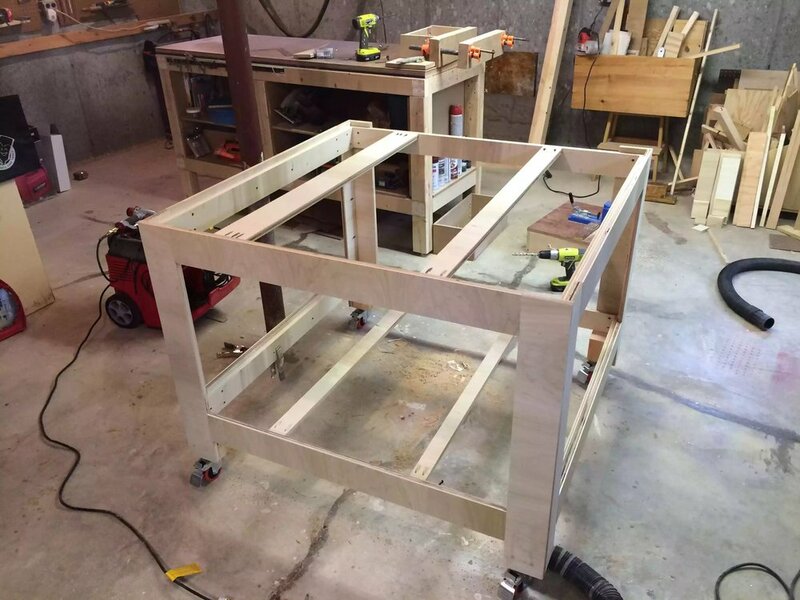 The entire table is made from 3/4” poplar plywood , it measures 48” sq and is about 36 3/4” high. 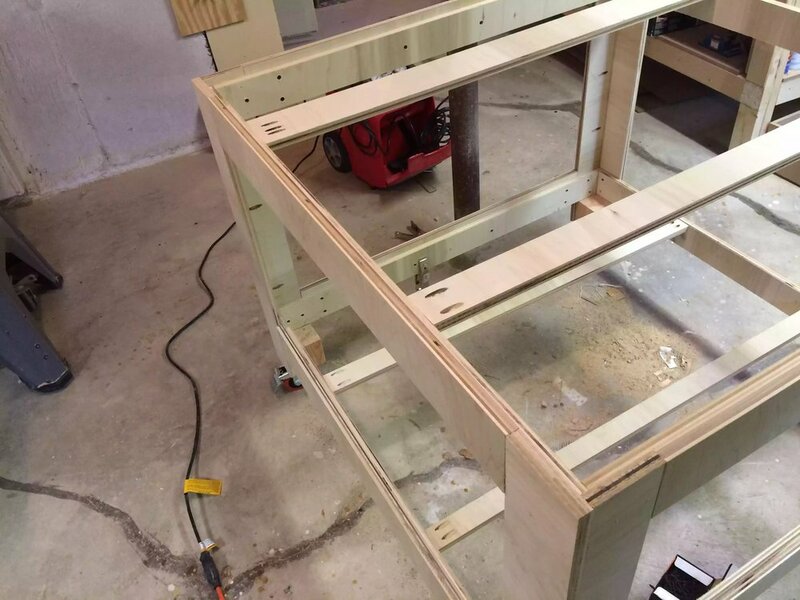 The legs are just an L form secured with glue and pocket screws. The stretchers are also glue and screwed into each leg. 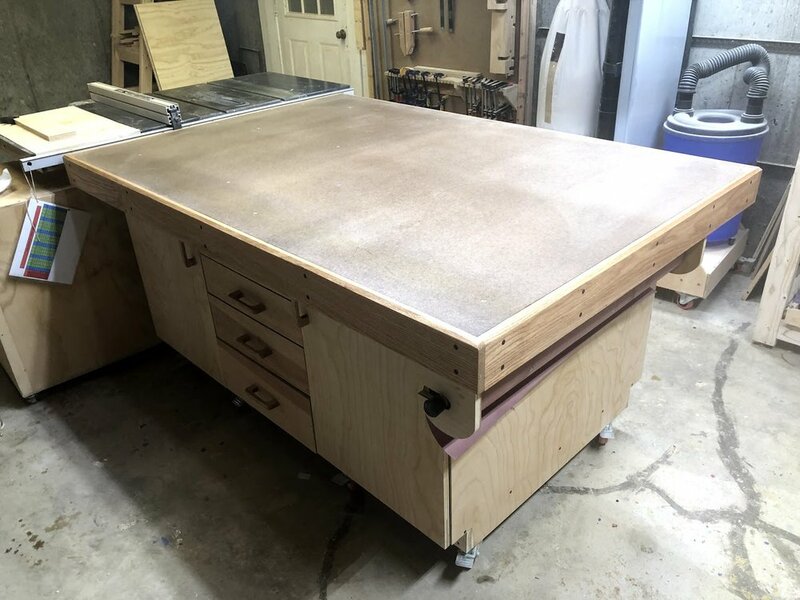 This project took me an age to make, but its still getting heavy use in the shop today, I do need to replace the top as it has gotten extremely beaten up as an assembly table, I am also looking into possible making a Paulk style outfeed table, but I haven't decided yet.